Multicam Vests & Chest Rigs, Manufactured by Intelligent Armour in the UK to full military specification using only the best possible materials including genuine Crye Multicam. The IA Multicam Light Assault Vest is designed as a load-bearing Molle compatible vest for special operations, manufactured from Crye Multicam mesh for weight reduction. 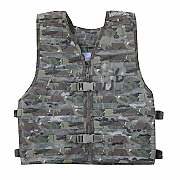 Incorporating tried and tested features; our Multicam Assault Vest avoids unnecessary gimmicks and is exactly what operators require in an assault vest; strong and lightweight.